Reader Lights Up the Night with a Correct Answer! Congratulations to Cornelia for correctly answering the Mystery Photo question for December 2016. 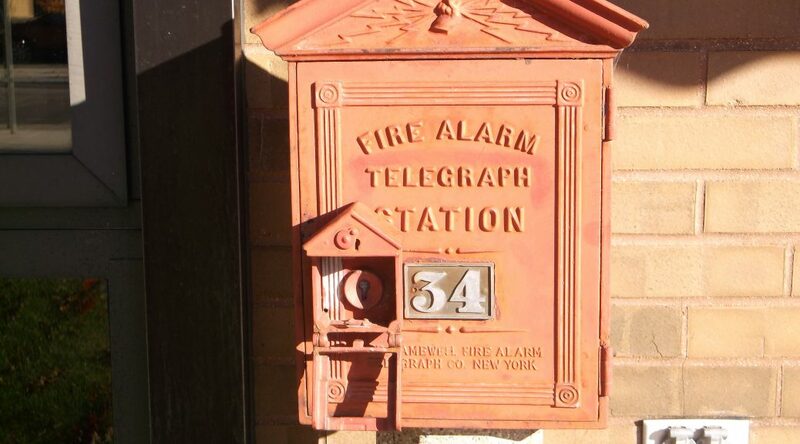 The last fire alarm box in Traverse City resides at Fire Station No. 1 on West Front Street, beside the main pedestrian entrance. Well done, Cornelia! 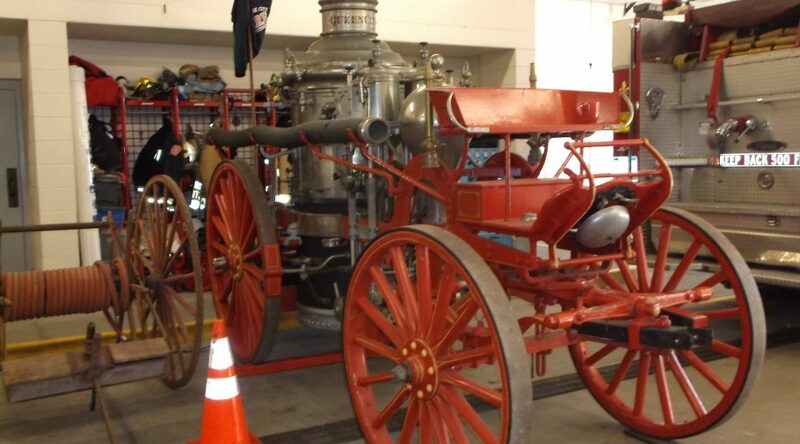 We offer kudos to the Traverse City Fire Department which honors its history. Thank you all for your service! For those of us who appreciate the historic architecture of Traverse City, a sad fact is that many of our early buildings no longer exist. For most buildings, it has been either a result of fire or progress. When it comes to our historic schools, it is a combination of both reasons. There is only one remaining pre-1914 school in our town. It too, however, will soon be demolished and replaced. In the upcoming year, plans to raze and replace the Immaculate Conception school have been put in place. 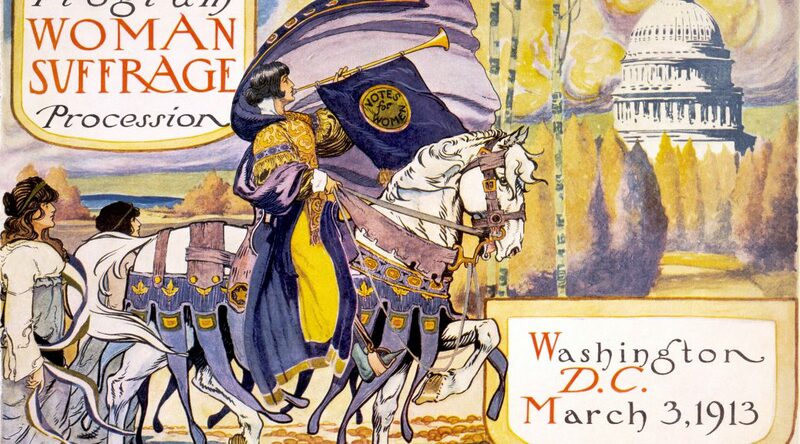 As early as January 1900, it became apparent that a second Catholic church was needed. The Catholic population of the city had grown dramatically and the St. Francis parish was becoming overcrowded. Many poorer, working class parishioners on the west side of town also felt it was inconvenient to travel so far. 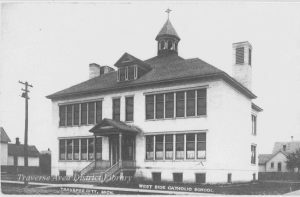 By late 1901, there was more talk about a possible new church and school for the west side. This side of town was home to many Bohemian, Polish, French, and German immigrant families who did not all speak English. They voiced their desire to be able to attend services closer to their homes, and in their own languages. St. Francis only conducted mass in English. In May 1902, it was decided by a church committee to establish a new parish. It would be called the West Side Catholic Church and school. The Bishop at Grand Rapids appointed Rev. L. Krakowski, who had been associated with the St. Francis church as well as other parishes in the region, to establish a west side congregation and start the process of raising money for a combination church and school building. Fundraising was enthusiastically begun. Oyster suppers were held, plays and performances put on at the City Opera House, ice cream socials, raffles and many Pedro card parties were held, all to raise funds for the new structure. It didn’t happen quickly, however. After much discussion between committee members, a location was chosen near the corner of Second and Division streets. In January 1903, Rev. Krakowski went to Grand Rapids to get the official approval of the Bishop for the new church. Immaculate Conception School on Division Street, photographic postcard, undated. 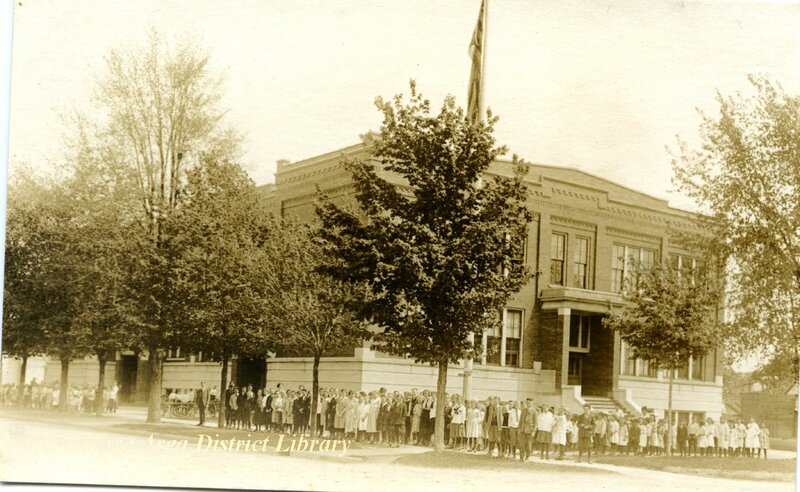 Image courtesy of Traverse Area District Library, image 4817. For two long years the parish worked to raise money for the proposed $15,000 structure to be designed by local architect, Fred E. Moore. 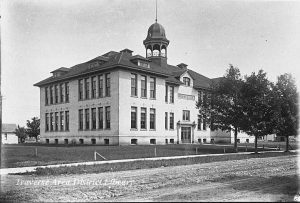 Construction began in the spring of 1905. Contractor Bert Wilhelm supervised the building of architect Moore’s plans. The building plans included plumbing even though there were no water lines or sewers on that part of the west side at the time. It was decided by the City Engineer that temporary water and sewer lines would be extended down Division St. to accommodate the new structure, but, since plans to install city sewers there were not yet in place, “the easiest and cheapest [sewage] outlet would be to build from Second Street to the Asylum Creek at a cost of $150.” [TCRE 8 Aug., 1905] The building was completed and ready to accommodate students by the beginning of the school year. The Immaculate Conception Church was officially dedicated on February 22, 1906. Rt. Rev. Bishop Henry Joseph Richter of Grand Rapids, assisted by seventeen priests of the diocese conducted a four hour service attended by over 700 people. So many people came that they filled the hall to standing room only. Many who came were not even able to get in. The new church would have Rev. John J. Sheehan as priest in charge, with the school staffed by the Sisters of Mercy of Big Rapids. The small parish worked through difficult circumstances, but eventually paid off the mortgage in thirty years and became debt free. The church and school were operated in this building until it too, became overcrowded. It was always intended to be a temporary situation- having the school and church in one building. By 1951 it was time for more room. “In the last few years the parish has grown…overflow crowds demanded an assistant priest, but even with four masses each Sunday, the church remained overcrowded and the school had to limit its enrollment for lack of necessary classrooms. The only solution was a commodious new church to accommodate the ever increasing throngs and to enable Catholic visitors to attend mass in the summer and to allow expansion of school facilities.” [TCRE 28 May, 1953] A campaign began to raise money for a new church. In 1951, Architect Harford Field was hired to design the modern structure. 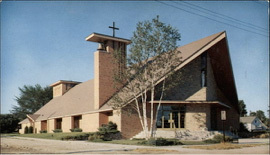 Ground was broken on May 23, 1952, “the cornerstone was laid and the bell blessed on August 10, 1952 in a colorful ceremony presided over by Monsignor R. H. Baker, vicar general of the Grand Rapids diocese. The church was completed and opened for services on Easter Sunday, April 5, with Rev. Passeno saying the first mass.” [TCRE 28 May 1953] The church was officially dedicated on May 30, 1953. Seven years later, it was clear that a larger school was critical. The parish officials once again turned to architect Harford Field to design an addition to the school. The new school building would cost over $400,000 and include “eight classrooms, art room, library, music rooms, visual-aid room, general administration offices, cafeteria, kitchen, adult social room and gymnasium-auditorium…” [TCRE 20 May 1961] At the time, there were over 400 students enrolled in first through eighth grades which were staffed by the Sisters of Mercy as well as lay teachers. So, fast forward to the present. Once again the Immaculate Conception school has out-grown its facility. In September, 2016, plans were announced that replacement of the 1906 and 1961 buildings was being discussed and brought to the planning commission for review. 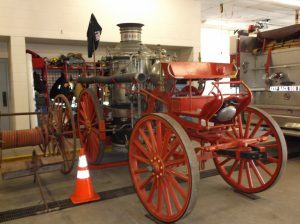 At that date, $9 million had already been raised for the new $12 million structure. Yes, it is sad that another historic building will be demolished, but that is the way of progress. The cost of renovating old buildings to today’s standards is not always the best solution, especially when so much more space is needed. This has been the consistent history for the majority of our old schools. Most were demolished during the 1950s because they had become out-grown, out-dated and just not in line with modern school needs and standards. So, the last of the city’s pre-1914 schools will soon be a memory, but the new building will be an attractive asset to the community and will meet the needs of the school and parish. 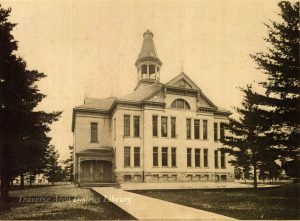 Boardman School- 1890-1913- burned, but replaced in 1914- (still standing- Ida M. Tompkins administration building) In May, 2016 was also being considered for demolition. 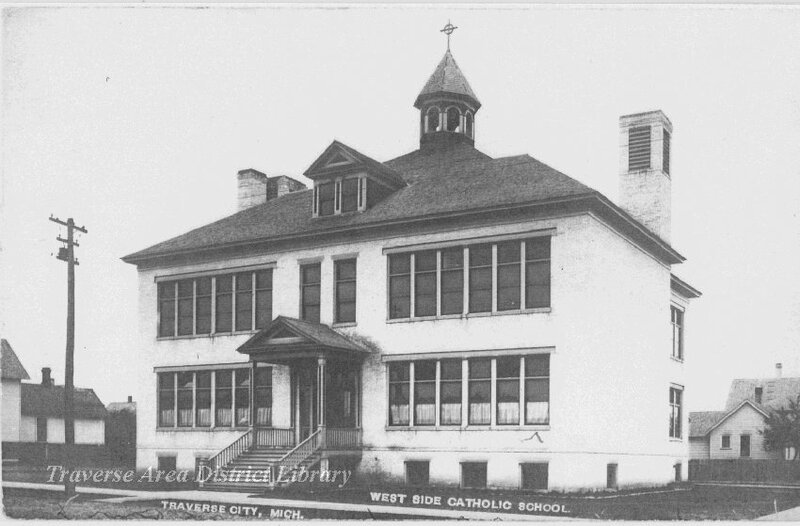 West Side Catholic- Immaculate Conception- 1906- 2018? 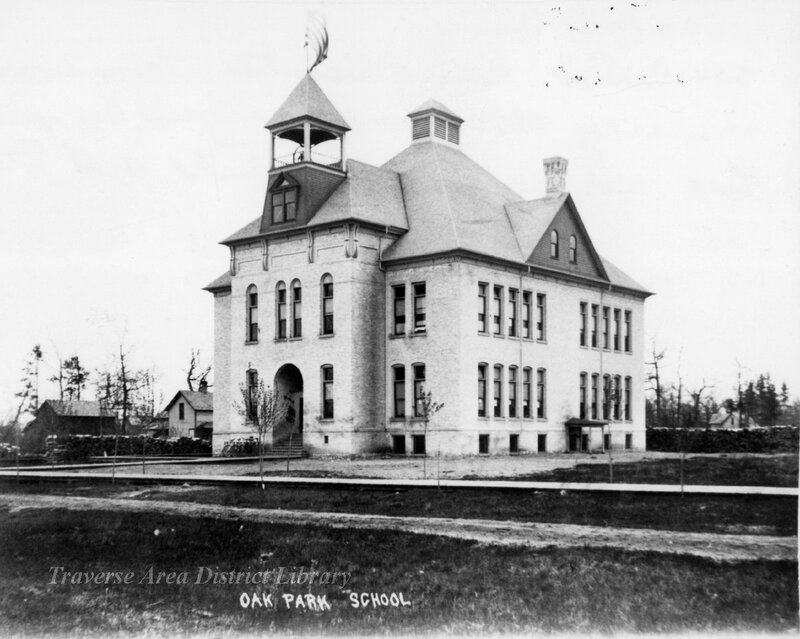 Oak Park School, image courtesy of the Traverse Area District Library. 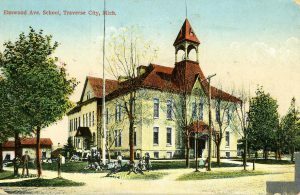 Elmwood Avenue School, Traverse City, photographic postcard. Image courtesy of Traverse Area District Library. Boardman School, ca. 1915, image courtesy of Traverse Area District Library. 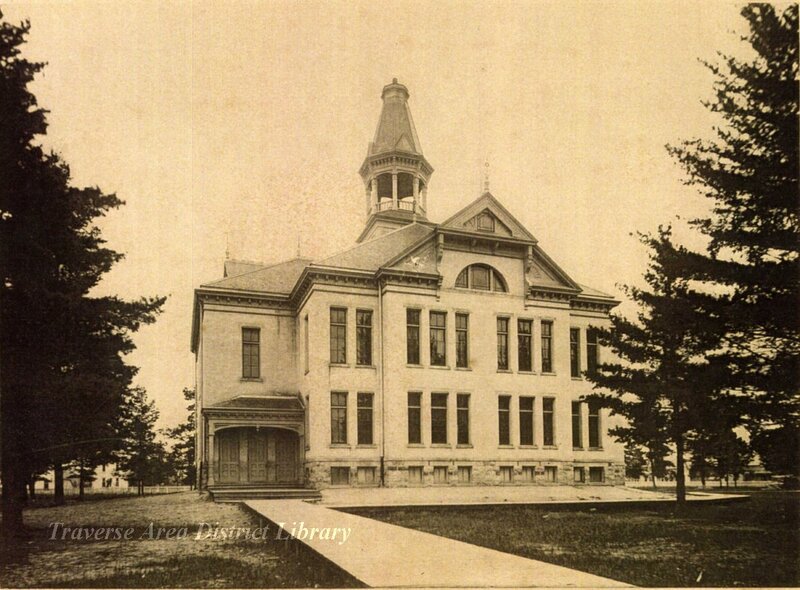 Union Street School, undated, image courtesy of the Traverse Area District Library. 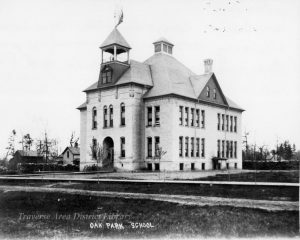 Central Grade School, ca. 1890s. Image courtesy of Traverse Area District Library. 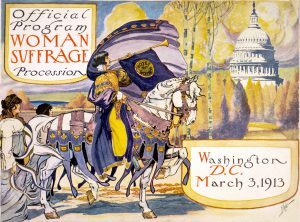 All are welcome to participate in a non-formal discussion of the Women’s March on Washington, January 2017, at the Women’s History Project’s annual Souper Sunday. Several attendees, including Becky Beauchamp, a local organizer, will be present to answer questions about their experience. Attendance is encouraged for all those who participated and those who wished they could, and anyone who has ideas about the March, women and our place in history. The WHP Souper Sunday is an annual event for the public, featuring camaraderie, a casual and delicious soup luncheon, and a thought-provoking program, all for a $5 donation. The event will take place on Sunday, February 5th, from 12:30 p.m. to 2:30 p.m. in the McGuire Room of the Traverse Area District Library, 610 Woodmere Avenue, and will feature our traditional hearty lunch of soup, bread and desert – catered by Centre Street Café. Reservations are requested by February 1st. Call 231 421-3343 or email sansep19@earthlink.net. Thursday, January 12, 2017, “The House of David” by Al Bryant. The House of David, a religious commune founded by Benjamin and Mary Purnett in Benton Harbor, MI, in March 1903, had a branch in Aral, MI, a ghost town which is now part of Sleeping Bear National Lakeshore in Benzie County They were nationally know for their baseball teams, music bands and for the fact that men and women lived separately. Al Bryant graduated from Olivet College and Western Michigan University, and gives programs for libraries, museums, schools, clubs, churches and libraries. A mystery photograph was discovered in the depths of the local history collection at Traverse Area District Library. The image was of a young woman, finely arrayed in a crown and cape, the picture of regal. Our only clues: the photographer’s studio (E.N. Moblo of Traverse City,) and a name written in white (Edna Regina). This revelation blew the case open. Traverse City did indeed host a three-day carnival on July 3-5, 1900. It must have been a well-anticipated event, as both the steam ships and the trains ran special routes for the occasion. The Silver Brothers’ New Tent Novelty Show and Great Trained Animal Exhibition traveled north to provide entertainment to the masses. 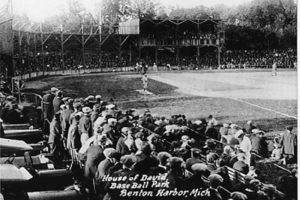 All manner of street and Caledonian games were played throughout the city, and at least two parades and “the most brilliant display of Fireworks ever seen in Northern Michigan” were sure signs that the City was out to have a good time. Perhaps even more thrilling than the Carnival itself was the race for the Queenship, an elected position. Such was the furor of the election, that votes were announced every half an hour, starting in the early evening and not finishing until 10 o’clock that night. Edna won by a large margin, receiving 3,423 votes. After her came Miss Minnie Rattenbury, with only 1,216 votes to her cause. Each dollar donated to offset the cost of the Carnival equaled one vote. One “anonymous” gentleman (although the newspaper identified him, based on the thickness of his voting envelope) placed $253 in Edna’s tally box, no small sum in 1900! How was the news received? According to The Morning Record, “As soon as the result was announced there was a cheer and immediately there was a rush for the door. The band began a march and a line was formed in the street. In a few moments the crowd started for the residence of Miss Wilhelm where that lady was cordially congratulated upon the result of the contest and a serenade was given.” We can only imagine the glow on Edna’s cheeks upon seeing the throngs serenading her on her own doorstep! The Carnival Committee was bound to prepare a fine celebration, paying attention to all the details, not the least of which was Queen Edna’s apparel. 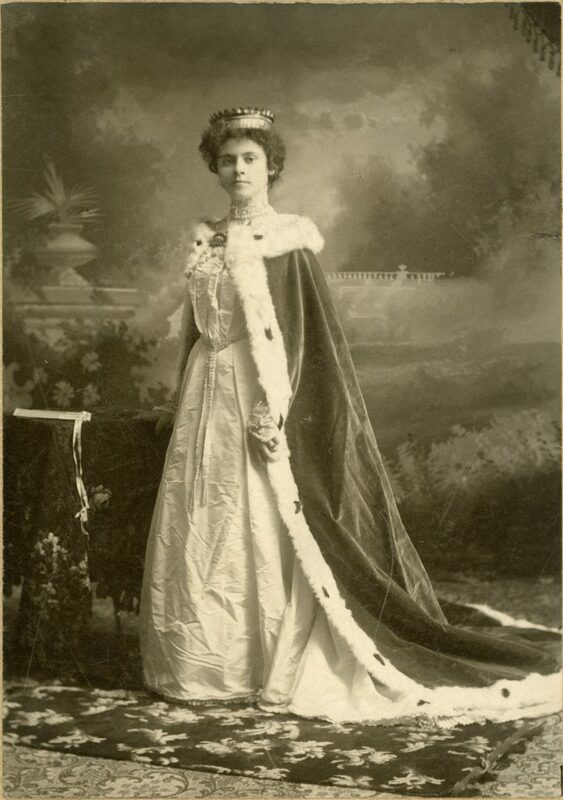 The “regal robes and crown” were acquired at once, and the Committee was quoted on the matter, stating “it is a foregone conclusion that the magnificence of her apparel will excel anything ever seen in this city.” By the photograph that remains, we agree with the Committee: fine attire for a fine lady. Edna was a woman with moxie, it seems. 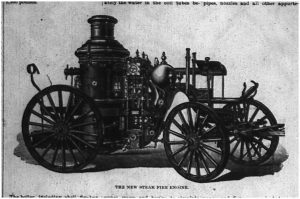 In addition to performing her duties as queen admirably, she was the chief operator for Citizens Telephone, and she once saved the books of that business from going up in flames in a 1901 fire. She was the daughter of Frank and Anna Wilhelm, and sister to Gilbert and Blanche Violet. 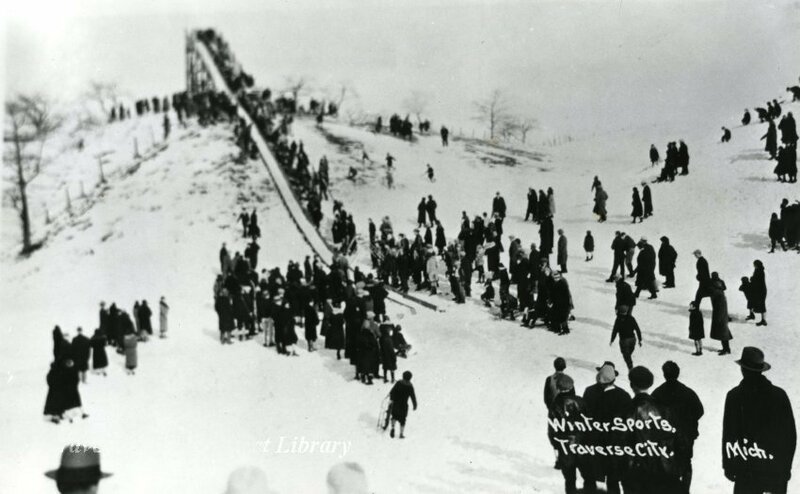 The whole town was excited–on New Years Day the toboggan slide would open. For weeks townspeople had watched the gigantic structure emerge above the tree line near the intersection of Franklin and Webster streets. 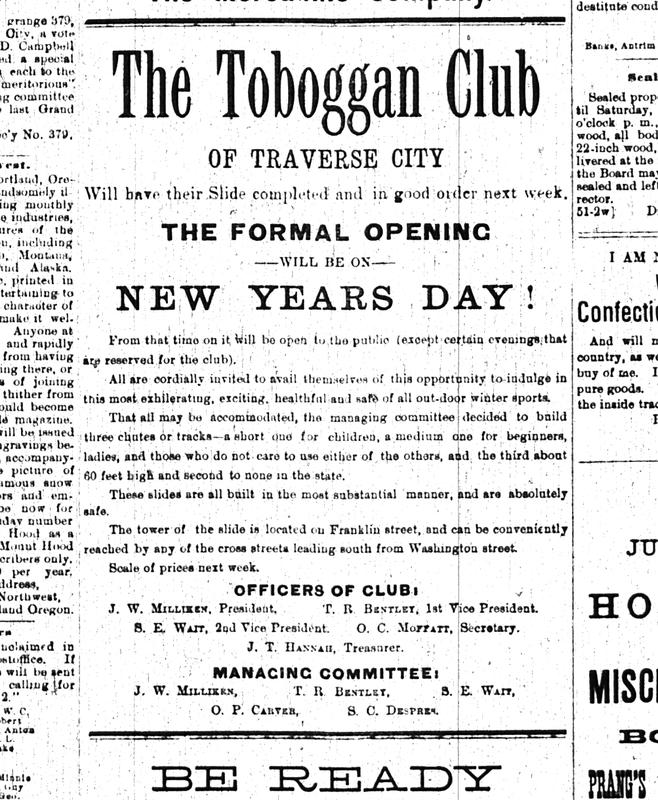 The Toboggan Club of Traverse City had created the tower and supervised its operations. Two smaller runs—for the young or the faint of heart—extended from a hill nearby, probably located where two residences now stand at the corner of Webster and Railroad streets. 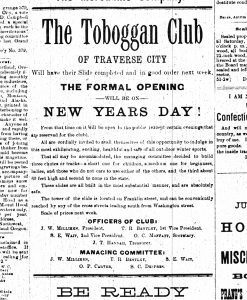 Article on the Toboggan Club of Traverse City, from the “Grand Traverse Herald,” December 23, 1886. With a board of directors of distinguished citizens—long-time resident S.E. Wait, storeowner James W. Milliken, Julius Hannah, son of the town founder, among them—the Club laid out simple rules to be followed by all participants. Each person would receive a badge for the season at a cost of ten cents. Participants would have to be thirteen years old to ride the steep slide and ten to ride the lesser one. Those that created nuisance would be removed from the site. 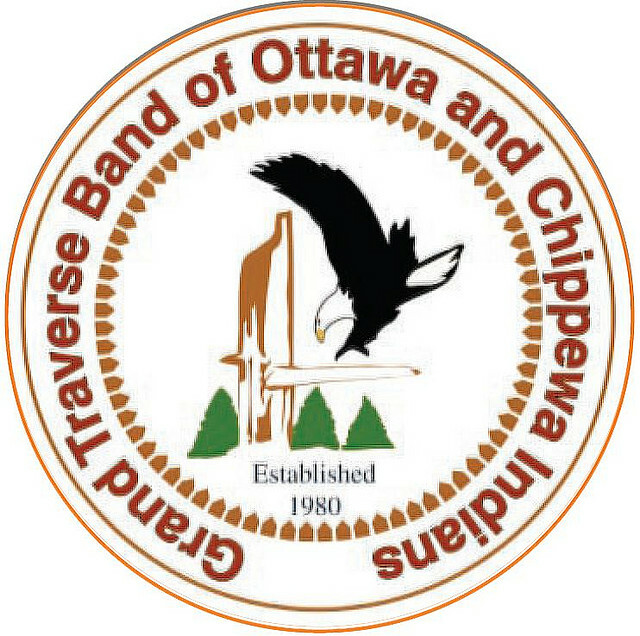 The tone of the advertisements published in the Grand Traverse Herald as well as the price of a badge suggest the project was a civic undertaking not intended to generate a profit. The “best slide in the state” offered a thrilling ride. The chute was packed with snow and then watered down to make ice, a surface that shot riders down the steepest part of the slide in seconds. Screams accompanied the descent and continued for the quarter mile the toboggan coasted. It was not a ride for the faint of heart. The boast about the slide being the best in the state suggests toboggan slides were popular in Michigan at this time. Indeed they were popular, not only in our state, but across the nation. N-Gram Viewer, a website that examines word usage from 1800 to the present, shows the rapid rise in the use of the word “toboggan” beginning in 1880. It reached a peak in the later nineteen century, only to rise again in the 1920’s, since dropping off. Toboggans were a fad that rose rapidly, only to subside after a few years, and then to revive after a thirty-year hiatus. In the 1880’s the “toboggan suit” became a necessity for young active women to wear on the toboggan runs. It was described in the Ladies Home Journal as a garment with a removable hood, very warm, loose-fitting so that it can be worn over a wool dress. It allowed the arms to move freely, containing “nothing to hurt,” even if the wearer does get “left” in a snow bank. Presumably men’s clothing stores carried toboggan suits, too. Toboggan Slide Blown Down. This is unfortunate as it would have provided a fine outlook for the town during the summer months…The girls in town are all mourning over the destruction of the toboggan slide. One by one they bring out their jaunty suits and, looking sadly upon them, wonder what in the world they can use them for now. It is too bad a pretty girl—and our girls are all pretty—in a toboggan suit is as fair an object the world of handsome women can show. But, sic transit gloria mundi—and it was a blue Monday too for the dear creatures. The Herald sympathizes with them from its inmost soul. It wasn’t just Traverse City that saw an abrupt end to its toboggan slide. The fad evaporated all over the country at about the same time. In 1886 the Chicago Tribune quoted a New York newspaper that remarked upon the rage of tobogganing, but only three years later, reports from many locations indicate the toboggan chutes had disappeared. Some attributed their demise to a fatal accident of a celebrity in Vermont in the winter of 1887. It is not hard to imagine injury and death resulting from plunges from a sixty-foot tower. One unexpected injury occurred in Traverse City’s slide. W.D. C. Germaine, a colorful personality and future mayor of Traverse City, decided to impress the ladies with a daredevil exploit: he would ride the chute on a coal shovel. And that he did, forgetting that friction between the shovel and the slide generates a great deal of heat. At the end of the run, it is said he had two great blisters on his behind. 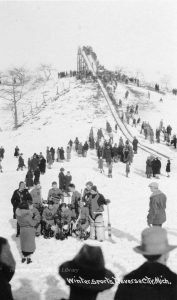 Picture of the toboggan run at the Traverse City Golf and Country Club was taken in the 1920s near the 16th green of the golf course. From the Bensley Collection, Traverse Area District Library. Though the toboggan towers disappeared in many towns before the end of the 1880’s, tobogganing as a sport continued for decades afterwards. In 1924 plans were made for a toboggan trail that would run down Boughey Hill (the hill where the Country Club is located), joining Pine Street until it reached 14th. Facing opposition from that neighborhood, the Kiwanis Club constructed a another run on the Country Club golf course that descended south from the tallest hill, crossing a seldom-used Cass Street, and ending up at Boot Lake, a pond between that road and Boardman Lake. It was said to give “a thrilling ride for 400 yards.” Apparently, the threat of traffic on the road was not enough to discourage those wanting the speed and excitement of toboggan fun. At this time sleds and jumpers were as common as toboggans. “Flexible Flyers” made it possible for riders to steer the sled with feet or hands when descending a slope. Used in limited places in the country–the Traverse area among them–jumpers were often made from a single wooden ski. 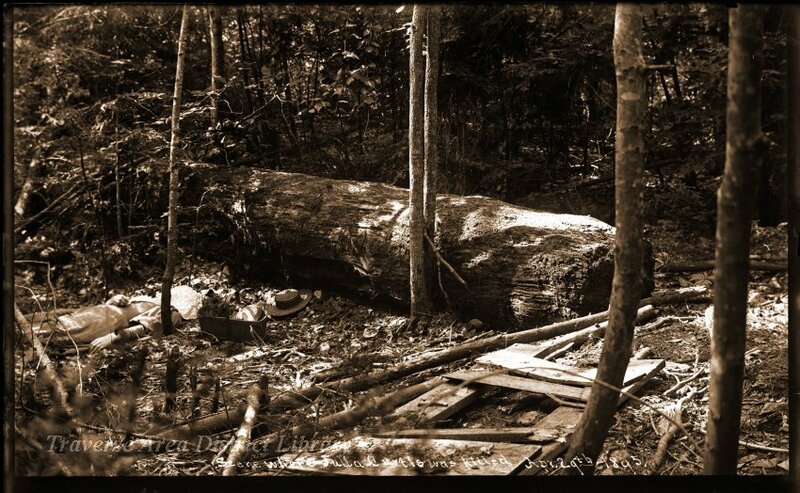 A wooden seat was mounted on it from which the rider would (attempt) to guide the vehicle with his/her feet. The contraption was not stable and often pitched its rider into the snow: Riding a jumper was not a sport for those afraid of injury. In more recent times, Boughey Hill was the place for sledding, the course proceeding through the woods, challenging sledders to avoid colliding with trees. As newly constructed homes interfered with that route, an open area had to be found, but there was scant space within the city proper. As always, the wide expanse of the Country Club golf course was the place young children gathered for winter fun but no thrilling toboggan runs were set up. The hills and valleys close to the clubhouse provided enough thrills for families. Times change and toboggans give way to skis and ski boards—at least for teens. That is what happened in Traverse City in the second half of the twentieth century. Hickory Hills to the west and Holiday to the east presented marvelous slopes with lifts, warming houses, instruction, and a panache that made those places fine hang-outs for the young. High schools offered skiing as a recognized sport, heightening interest still further. The thrills of a sixty-foot toboggan run of the 1880’s were duplicated by a fast run down a ski slope in the 2000’s. Then as now, the young will find a way to enjoy the winters of Northern Michigan. Here are two images of the Queen City No. 2 Steamer, separated by more than 200 years. Traverse City’s second Steamer is still preserved at a location near Lansing, Michigan. Where would you go to view the two steamers? Extra credit if you get both! 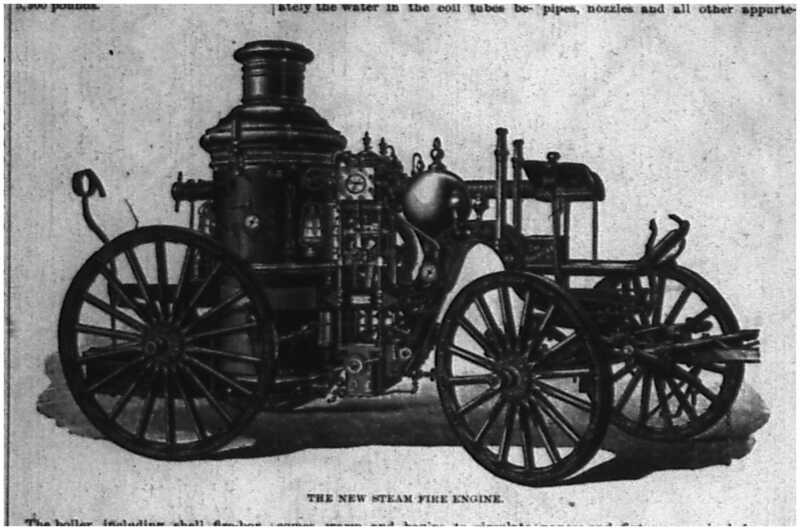 Image from the “Grand Traverse Herald,” 1895. Image courtesy of the author… this is somewhere in Traverse City.